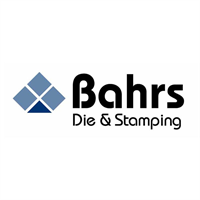 Bahrs Die & Stamping Company, Inc. Looking for a progressive small part, light gauge metal stamping manufacturer with expertise in multiple industries that isn’t an ocean away? Since 1939 Bahrs Die & Stamping has combined German tool and die making expertise with outstanding progressive metal stamping technology to achieve one of the most respected reputations in the industry. This combination of die stamping expertise and technology allows Bahrs to participate in the international marketplace. Complex, light gauge, small metal products or innovative designs require high precision stamping procedures. Manufacturers often seek out a die stamping company that specializes in complex or high precision metalwork. Bahrs has the considerable experience and advanced technologies necessary for fabricating metal products with intricate geometries, folds, cuts, or engravings with exact specifications. Bahrs Die & Stamping is situated close to raw material suppliers and related services, permitting freight cost and shipment times lower than many competitors. With the demand for specialty raw materials and selective metal plating requirements, this is an important advantage. We pass these savings on to our customers while serving the rigorous requirements of our customers’ industries. To request additional information click the link below. Centrally located in Cincinnati, Ohio, Bahrs Die & Stamping is a leading manufacturer of die stamped light gauge, small metal parts including the lighting industry, custom & standard parts, brackets, covers, frames, shields, connectors, outlet box plates, shields, washers, welding straps & progressive dies. With presses from 27 to 176 ton capacities for materials including aluminum, brass, steel, stainless steel & galvanized steel, Bahrs works with coil, sheet or strip stock. With an in-house tool & die facility to serve our die stamping customers, we are metal stamping specialists with nearly 80 years of experience! We offer the optimum in quality small, light gauge, die stamped parts, die and parts design assistance and delivery at competitive prices. By updating our equipment and constantly looking for new ways to improve we’ve reduced lead times and introduced new services and products. Our customers are quality-driven companies who appreciate how well we know metal. Since we are not an ocean away we can react quickly to rush orders and design modifications. Many of our dies are designed with interchangeable parts. And, we always pass on our savings to the customer. In a recent survey, our customers told us their favorite thing about Bahrs is that our employees care. This is reflected throughout our relationships, from the products we make to the promises made. Bahrs is family-operated, but to everyone here, it’s their company and they are proud of it.